Fantasy football is all about value. Devonta Freeman was great again last year, but Jay Ajayi was almost as good and he was available in the 9th round or later. Never enter a draft with a set target for each round. Play the draft as it comes. Use Average Draft Position to get a sense of where guys will go, and watch for value that drops. 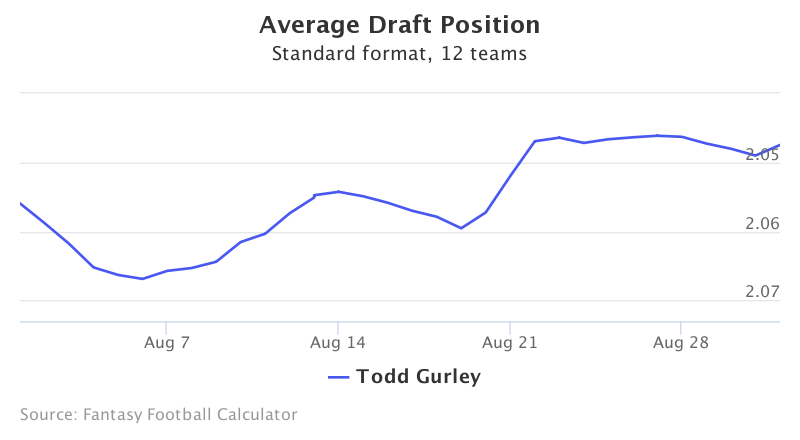 Todd Gurley could be a post-hype sleeper after a disappointing sophomore season that crashed many fantasy campaigns in 2016. 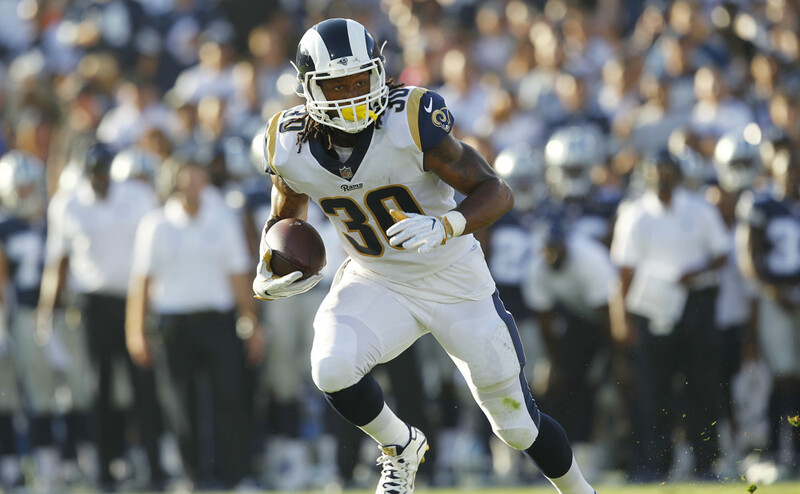 Owners are more cautious this year, giving Gurley a mid-2nd price tag. Gurley suffered as the focal point of a horrible offense with a bad line and a even worse QB in Jared Goff. Goff should improve under new head coach and QB guru Sean McVay, and the offensive line should be a little better too. Gurley gets as heavy a workload as any RB and should improve from his 3.2 YPC last year. The addition of Sammy Watkins should stretch the field and get eight and men out of the box and Gurley will have room to run and chances to score touchdowns. He could be this year’s LeSean McCoy. The Browns are a punchline in the NFL, but Isaiah Crowell is no joke. He was a steal last season and could still be a great value in the 3rd round. Cleveland was horrible last season at 1–15, and Crowell had 12 carries or fewer in nine of the 16 games despite being the main option on offense. This year’s Browns are not about to change the league but they did add QB DeShone Kizer and made huge improvements along the offensive line. 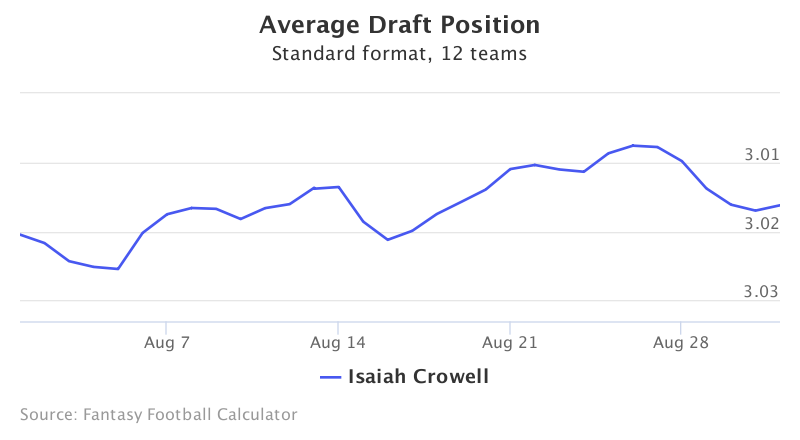 Fantasy football is about volume as much as anything else, and Crowell has no backfield competition. He should see enough touches in a RB-friendly offense to push 1500 yards and end up safely in the top ten. 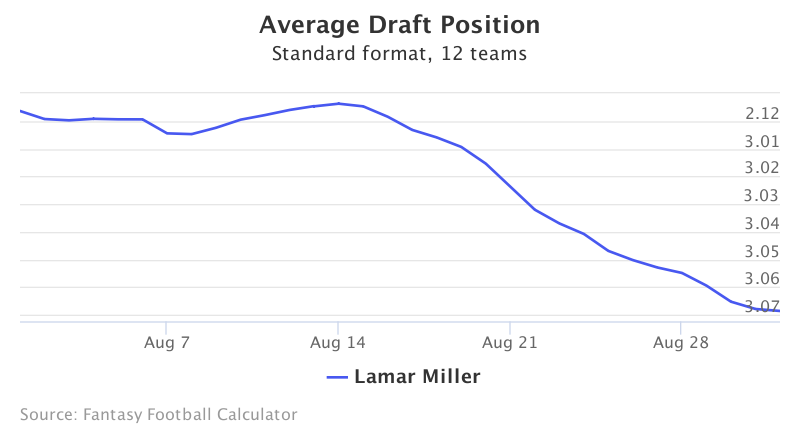 Lamar Miller was a first round pick last year but struggled to produce consistently, finishing as RB17. That’s about where he’s being drafted this fall. Like Gurley and Crowell, Miller is a workhorse that’s sure to see many carries and receptions. And like those two, he should benefit from much more stable QB situation that improves the entire offense. Rookie Deshaun Watson looks like the real deal and should be a massive improvement on Brock Osweiler. That’s sure to increase Miller’s YPC and should also boost his TD% back from 1.9% last year to his career 3.0%, or higher. He may be a year late to the party, but Miller is ready to shine. 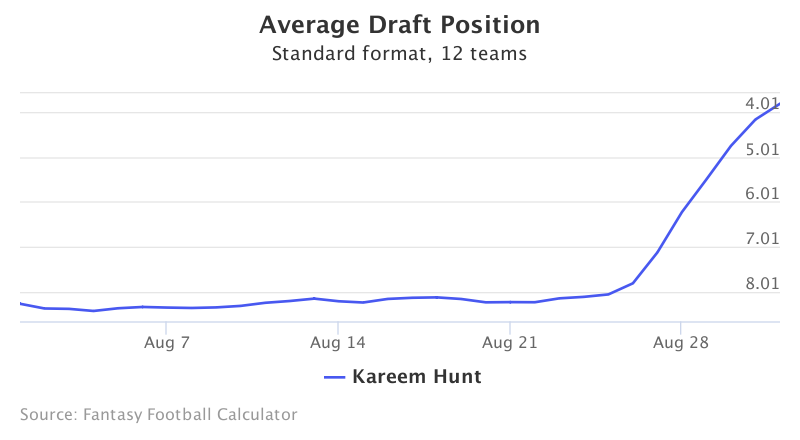 Kareem Hunt was already a nice sleeper before Friday night, but a Spencer Ware injury has opened the door for Hunt to begin the season as the starter, and his ADP is rising quickly. Hunt was a TD machine with 45 scores at Toledo, and he’s good out of the backfield with 41 catches his senior season. Now he could be the lead back in an offense built around the run. Ware averaged 16 carries a game as the Chiefs starter, so Hunt should see a high volume. Even if Ware comes back later in the season, Hunt may not give the job back. Hunt would’ve probably been a top 30 pick if he had been hyped all offseason. Any pick in the 4th round or later will be worth your while. 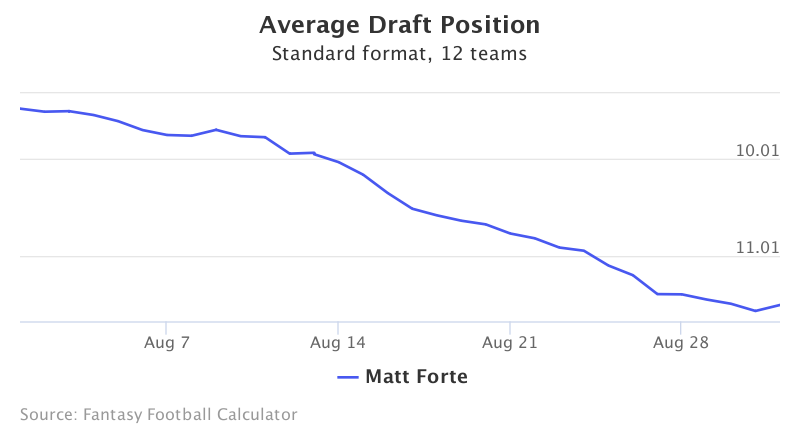 Matt Forte has been a fantasy football mainstay for almost a decade, but his Jets counterpart Bilal Powell is getting all the hype with a 6th round ADP while Forte slides deep into the latter rounds. It might surprise you to learn that Forte finished among the top 20 RBs last season. He’s old and has a history of leg injuries but has averaged 15 games a season throughout his career, a model of consistency at a volatile position. Forte’s YPC has fallen off but he still catches a lot of passes and should see plenty of work for a Jets team with few options other than him and Powell. Forte won’t win you a title, but at RB49 deep into the draft, he could be this year’s Frank Gore who fills a starting role adequately week after week. It’s tough to find much value at RB these days, but C.J. 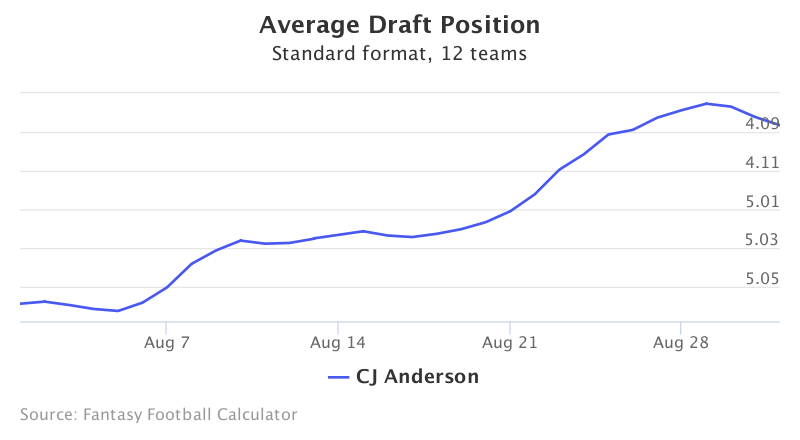 Anderson could get the full load in Denver and is being drafted as RB21 late in the 4th. Anderson averages more than 17 carries a game as the Broncos starter and has a career 4.6 YPC. He also sports an impressive 3.8 TD%. That means an average Anderson start is worth about 78 rushing yards with a 2/3 chance of a TD and a few receptions as well. Anderson is an injury risk and has yet to make it through a full slate, but he’ll get plenty of touches when healthy and that’s more than you can say for most of his 4th and 5th round competition.